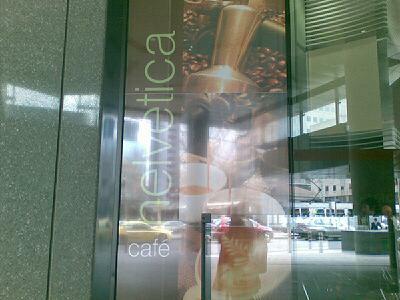 it’s a cafe in melbourne called ‘helvetica cafe’. that is pretty sweet if you ask me… but is does beg the question, did they name the cafe after the typeface, or choose the font after the name? this cafe has been mentioned before on the helvetica film blog. this kind of thing has happened before, there is a good flickr set about it here and it’s been dubbed LTypI or Lack of Typographic Imagination. Entry filed under: Graphic Design, Type. Tags: australia, cafe, design, font, graphic, Graphic Design, helvetica, melbourne, Type, typography. Would it be possible to upload it to the LTypI Flickr group? hello there and thank you in your information ? I’ve definitely picked up something new from proper here. I did on the other hand experience several technical issues using this web site, since I experienced to reload the web site lots of times prior to I may get it to load properly. I were wondering in case your web host is OK? No longer that I am complaining, but sluggish loading instances instances will very frequently affect your placement in google and could injury your quality ranking if ads and marketing with Adwords. Well I’m adding this RSS to my email and could look out for a lot more of your respective interesting content. Make sure you update this once more soon..
Wow, wonderful weblog structure! How lengthy have you ever been blogging for? you made blogging glance easy. The whole glance of your web site is fantastic, let alone the content material!